The question that has to be asked after the election is if the Spanish politicians will make up their minds to sign a government agreement or if there will be a snap election. The next days will be crucial for Spain and hopefully we will have the answer very soon. Spain held elections on December 20, 2015. The results were, more or less, in line with what was expected: the Parliament is more diverse than ever. The mainstream political parties, Christian Democrats (Partido Popular – PP) and Social Democrats (Partido Socialista Obrera Español – PSOE) no longer dominate the political scene. There are two ‘new’ political parties that have played a very important role since the election to the European Parliament in 2014. The two-party (also called two-and-a-half party) system of Spain has been challenged by Podemos (‘We can’) and Ciudadanos (Citizens). Today, forming a government is harder than ever, the current deadlock needs to be overcome. What has happened at the ballot box? The Spanish citizens went to the ballot box on 20 December to elect their prospective government for four years. The participation rate was 73.20 per cent, beating the level of 2011, which was 68.94 per cent. The ruling centre-right PP won the election with 28.71 per cent of the votes and 123 seats out of 350, while losing the absolute majority. Following a lingering period of economic hardship, austerity measures and a record-level of unemployment, the PP, remarkably, still ended up with the most votes. Nevertheless, this is the worst result achieved by any winning party in the history of democratic Spain. Prime Minister Mariano Rajoy volunteered for the job again in his post-electoral speech, promising that he would form a ‘stable government’ for the entire country, representing all citizens. It is important to underline that Mariano Rajoy was elected in 2011, because it was the PSOE and its leader José Luis Rodríguez Zapatero whom Spanish citizens held accountable for the economic crisis. Since then the PP has been governing, while the economy has been recovering slowly. Still, as the main indicators do not show a clear exit from the crisis, the PP’s election result can be considered as a success even if they lost the majority in the Parliament. The PSOE has been going through leadership changes since the last election and a series of internal problems, which are continuing after the election. We should also underline that the challenger party on the right of the political spectrum is weaker than the one on the left – which is proportional to the losses of the mainstream parties. As we can see in Figure 1, the Spanish Parliament (which is called the Congress of Deputies) is more divided than ever. Before December 20, pre-electoral polls could not agree on which party would come second for a long time. The race between the PSOE and the emerging political forces of Spain, Podemos and Ciudadanos, has been extremely challenging until the very last minute. Ultimately, the PSOE got 22.01 percent of the votes and 90 seats and finished second followed by Podemos. Contesting the elections as a coalition of different leftist groups in some autonomous communities, Podemos got 20.66 per cent of the popular votes and 69 seats. In Catalonia, for example, they won more votes than the pro-independence forces. 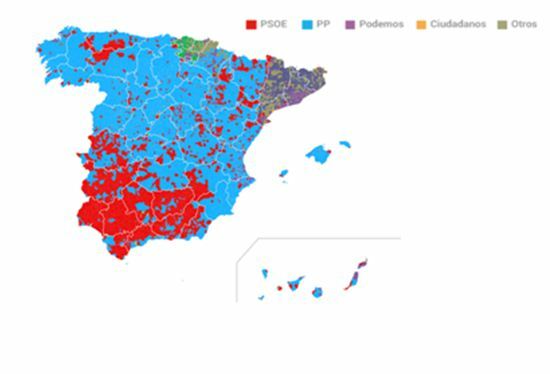 As we can see from the political map of Spain, the south is more leftist compared to the north. The only place we can clearly note the impact of Podemos is Catalonia, thanks to its alliances. Finally, with a result of 13.93 per cent of the votes and 40 seats Ciudadanos, a political party born in Catalonia, which competed for the first time in national elections, did worse than expected. One has to note in this context that the Spanish electoral system favours bigger parties, allocating them a higher amount of seats. End of the two-party system: a new era? Starting with the election to the European Parliament in May 2014, the party system in Spain has been changing. Podemos was founded in March 2014; in the aftermath of the Spanish popular uprising that is also known as 15M Movement. The party started to gain power in various elections since then. The party system change has already been visible in regional elections in Andalusia in March 2015, local elections and regional elections in May 2015 and in regional elections in Catalonia in September 2015. For understanding this phenomenon, one should look into Spain’s past. Since the general election in 1982 two main political parties, PSOE and PP, always got more than half of the seats, also close to 300 seats (out of 350) on many occasions. Although the two political parties got 213 seats together today, this election seems to change this trend. 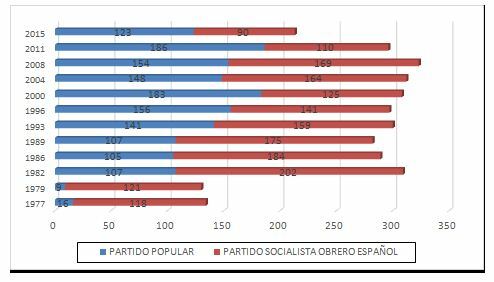 As we can see in Figure 3, the results of PP are their worst since 1989 and, in the case of the PSOE; this number of seats is the lowest of its history. In spite of an electoral system that favours bigger parties, this general election shows a change from a two-party (also referred as two-and-a-half party system by some Spanish scholars) system to a multi-party system. Note: The PP is founded under this name in 1989; the two previous elections correspond to its predecessors. This situation means a new scenario in Spanish politics: a fragmented parliament implies the necessity of alliances; politicians are now challenged to answer to the demands of the Spanish society. Only a coalition or a minority government is able to govern the country. Back to basics: how to form a government? In this most fragmented parliament in Spanish history, 176 seats are needed to form a government. According to Article 99 of the Spanish Constitution of 1978, the King of Spain, Felipe IV, will meet with the leaders of each party represented, and then propose a candidate as President of Parliament. It is very likely that the first candidate will be the leader of the strongest party. If the majority is not qualified after two consecutive votes – first an absolute majority and then a simple majority, there will be a new candidate. This process will start on January 13, 2016 when the Parliament is constituted, and may take at most two months. If the new government will not be formed and voted within that time frame, the Parliament will be dissolved and a snap election announced. A grand coalition in Spain is very unlikely. The leaders of PP and PSOE met shortly after the election and discarded this option very quickly, for now. Pedro Sánchez, the leader of the socialists, said he will not vote for Rajoy as President and he will try to form ‘a government of change’. In spite of his refusal, he is undergoing a certain pressure to abstain from voting and letting the PP govern with support of Ciudadanos. However, it is important to underline that if the PSOE supports the PP in order to maintain stability in the country, this could play in the hands of Podemos and lead to its own extinction in the mid/long term, as happened to PASOK in Greece. When we look for ideological coalitions, a possible right wing coalition of PP and Ciudadanos does not qualify for the formation of a government. In addition, the leader of Ciudadanos claimed that his party is bound for a change in the country and would not sign up for any government with the PP. A left wing coalition of PSOE, Podemos and the United Left (IU) may suffer the same fate. In the formation of a coalition government, small nationalist parties will be the major players. In the meantime, the PP will dominate the Senate, the upper house of Spain’s Parliament, which means that important reforms will require a consensus anyway. A left wing alliance is another possibility. 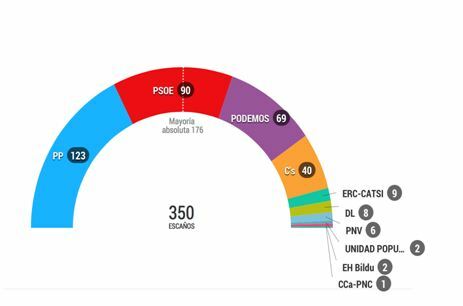 However, the coalition of three left wing parties (PSOE, Podemos and the United Left) is only possible with the abstention of Ciudadanos or with the support of nationalist parties. The first scenario seems not viable because of the many disagreements between them. And the alliance of PSOE and Podemos depends on their respective attitude towards the future of Catalonia. Not only will the role of nationalist parties be key in this issue, but also the idea of each political party considering the future of Catalonia. While Podemos wants a referendum in which Catalans can decide on their destiny, the PSOE is opposed to ‘any attempt to break with the constitutional rule’. Catalonia is a red line for both political parties, which makes it a central issue. A so-called ‘alliance of change’ is also possible: a PSOE, Podemos and Ciudadanos coalition. It could be a way to avoid a new election and not let Rajoy to be president. Of course, this is not an easy agreement either. Although Ciudadanos has declared its preference for the list most voted for – which is the PP – they could think about such an alliance, but only if Podemos changes its idea about Catalonia. Since Podemos has declared that the referendum on Catalonia’s independence is essential, a Ciudadanos – Podemos alliance seems hard to achieve. The PSOE is the only party who can try to negotiate this agreement, but its internal leadership problems affect its negotiation power. Because a coalition based on ideology is not easy to form, it is time for imagination and negotiation. Since the leaders of Ciudadanos and Podemos have claimed that they will not enter a government that they are not heading, the formation of a coalition is very unlikely in general. Instead, we should think about a minority government with a negotiated support in Parliament. All these options seem equally difficult to realise. If no agreement can be reached, snap elections will be called. This scenario could benefit Podemos and the PP but it is difficult to predict results in a political climate that changes every day. Catalonia is in a crucial moment of its history as an autonomous entity that is also dominating national politics. The pro-independence parties in Catalonia considered the last regional elections of September as a ‘plebiscite’, feeling the electoral results could be understood in terms of ‘yes’ or ‘no’ to independence. Because of this, the main pro-independence political parties (CDC and ERC) reached an agreement for a pro-independence list, Junts pel Sí, although an extreme-left pro-independence party called CUP remained outside this coalition. The results made the great division within Catalonia society regarding the possible independence from Spain visible. If we take into account the number of seats, the pro-independence parties got 72 seats against 63 of the no pro-independence. However, if we look at the votes, the pro-independence parties did not reach the majority as they got only 47.7 per cent of the votes. Junts pel Sí took 62 seats needing two of the 10 seats from the Anticapitalism Party (CUP) in order to govern. But this alliance of pro-independence parties is doubtful as the CUP has refused to support Artur Mas, the former Catalan President, as the new president and leader of the independence process. The CUP declared they do not approve the current presidential candidate for Catalonia (Artur Mas) because of the corruption cases in his party. Despite this, some leaders of the CUP have been discussing whether to vote for or against Artur Mas since the regional election. On 27 December an important meeting held to decide on this question ended in an unexpected draw with 1515 votes for and 1515 against Mas. Given this result, CUP’s leaders decided not to vote for Mas as president in an extraordinary meeting on 3 January 3. Now the only possibility is to find a new alternative candidate putting pressure on Junts pel Sí. However a change of candidate would entail harsh internal tension between parties of the alliance and their supporters. If they do not find another candidate and replace Artur Mas, the Parliament will be dissolved on 10 January and Catalans will go to the ballot box again. The next days will be decisive for Catalonia’s future. In this context, the main political parties have expressed their positions about the situation in Catalonia. Podemos is the only one that is supporting a referendum. This option together with their conjunction with En Comú (a civic platform that governs in Barcelona) has led Podemos to get good results in Catalonia. The rest of political parties tried not to include the future of Catalonia in their campaigns. Nevertheless, it seems that the referendum and the future of Catalonia will be the key for possible alliances in national politics. So, it will be necessary to tackle the Catalonian challenge. Fortunately, Spain did not fall for the Eurosceptic extreme right, like France – and many other European countries. Emerging parties, especially Podemos – which is often named populist and counted together with Syriza of Greece, finished the electoral night with an outstanding success. The party has been established right before the European Parliament election of 2014, and achieved impressive results in just eighteen months. Although pre-electoral polls showed worse results than those reached, the campaign improved the image of its leader Pablo Iglesias. Another new feature of the recent election was the participation of the party leaders in a TV election debate with the exception of Rajoy. The PP’s leader only participated in a debate with the leader of the PSOE. On the other hand, the rest of the political parties, especially the emerging political parties, had considerable presence in debates and TV shows. This American style campaign was favourable for Pablo Iglesias’ image and contributed to Podemos’ recovery during the very last days of the election campaign. His message about the end of the two-party system, corruption and austerity showing its party as the only option of real change has succeeded. Although the statements of Podemos were more moderate than they were in the European election, they have brought ‘hope’ to Spanish citizens. Podemos is not Syriza in its structure either. The party has alliances with other political parties in Catalonia, Galicia and Valencia. These alliances brought them the mayor’s offices of Madrid and Barcelona. Although it has been a successful strategy to get more seats in the Parliament, building alliances to govern on national level is a lot more complicated. The idea of a referendum in Catalonia, for example, is so far the most controversial point to come to an alliance with the PSOE. Spain is going through the biggest challenge of its democratic history. It is time to negotiate, foster the dialogue and find a way to govern the country. Notwithstanding the election results, it is evident that Spain continues to tackle familiar difficulties; unemployment, corruption and fraud and the economy – according to the latest surveys. All these problems, and definitely the issue of Catalonia, require a stable government to solve. Spanish society wanted a political change and now it is time to find out whether Spanish politicians will be able to catch up with this expectation. The end of the two-party system opens the door to debate new issues. One of these issues is the reform of the electoral system. Podemos and Ciudadanos have proposed to change the current electoral system in order to get a more proportional one. Although these new political parties have achieved remarkable success in the last elections, it would have been even greater with another electoral system. In addition, the future of Catalonia is a challenge that needs tackling. New regional elections are very likely to occur. Catalan society is divided between those who are for and those who are against independence from Spain. This critical question is also affecting national politics and it is a central issue in the negotiations to conclude alliances. So, the final question is: will Spanish politicians make up their minds to sign a government agreement or will there be a snap election? The next days will be crucial for Spain and hopefully we will have the answer very soon.